There are a lot of recipes on the internet for how to make Mod Podge – here are all of the good reasons NOT to do it yourself. I get a lot of questions about how to make Mod Podge, and I've seen a lot of it on Pinterest recently, so I wanted to address with a blog post. Interestingly enough, I have been asked these questions for years. I should start by saying this is not a paid endorsement – no person or company asked me to post this, or even knows I'm doing it. I don't make money off the sale of Mod Podge. And while my blog might be all about Mod Podge, I get visitors using all types of decoupage mediums. I just don't want you to be disappointed. The truth is, I've gotten MANY e-mails from people (with pictures) who tried to make Mod Podge. These emails ask me why their photo/furniture/gift project is yellowing/flaking/peeling and what they can do. With further prompting, I find out that they made a glue concoction on their own by adding water to flour, or something along those lines. 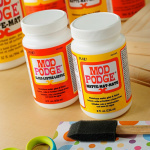 Mod Podge is a step above craft glue in terms of the sealing properties. 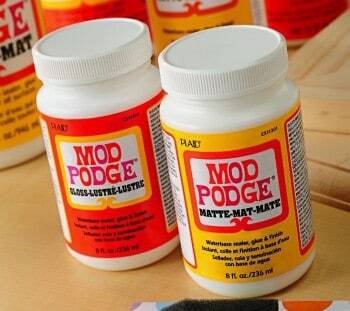 Mod Podge is glue, but it's also a sealer – and there are varnishes, etc. 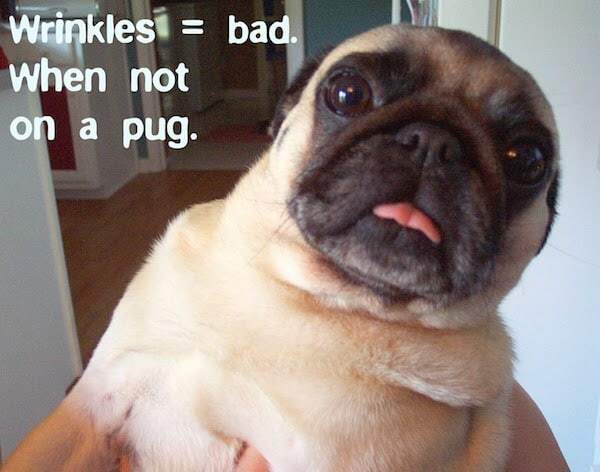 in the formula that don't exist in craft glues. The bonding properties of Mod Podge are way stronger than that of (most) craft or school glues. Long story short, the ingredients in Mod Podge are not the same as craft glue, and in 99% of cases are superior. That is why Mod Podge costs more than craft glue. And that is why it lasts longer and is more durable on projects. A lot of the homemade recipes take craft glue and dilute it with water, which is just about the worst thing you can do to make a decoupage medium of any sort. You're taking a glue that is inferior to decoupage medium and made it even thinner by adding water. This is why I receive pictures all the time of ruined furniture or home decor items that didn't last more than a few years before the paper started peeling off or yellowing BADLY. In the short term, the projects might seem okay, but over the years, the projects go down the toilet. And then I get very sad e-mails. Decoupage medium is more expensive than glue, but you'll notice on the glue aisle of any craft store that there is a wide range of pricing depending on what the specific glue does. The more specialty the application, the more it's going to cost. Mod Podge might be more expensive than glue and water, but the 8 oz. bottle lasts a long time, and you can always use a 40% coupon (do an online search to find them). Of course I think it's worth it – but I also have the proof: jewelry, home decor items and furniture that have been around for years and still look as great as the day they were made. I hope this helps. And I hope that if you want the project to last, you won't take the risk and make Mod Podge – that you'll use the real thing! If you're a newbie or can't figure out how to get rid of wrinkles, check out my learn-how article and videos. You can also learn about the eight original Mod Podge formulas in the video below, and ALL the decoupage formulas in my formula guide. Hi, Amy! It doesn’t surprise me that there are recipes for homemade mod podge (no capitals for that), but I wouldn’t hesitate for a minute to buy real Mod Podge for Any project where it’s needed. I wouldn’t compromise my hard work with something inferior. Great post! Thanks Amy for this important post! I know there are homemade mod podge recipes all around & i was happy that now i can enjoy mod podge(homemade) in PK but thanks a bunch for sharing your thoughts & others experiences with us! I’ve taken doll making classes where the teacher has us make our decoupage & it is so messy & does not dry well or flakes or just is nasty! So now whenever I take a class & I see certain ingredients, I always reach for my ModPodge. Why treat your art like it is cheap! Thanks for addressing this! I’ve also seen the homemade version but didn’t want to try it before I knew if it actually worked. Thank you Amy!! I love Pinterest but those home made concoctions on there were really disturbing me. Why anyone would try to make their own when you know who(s) has 40% off at least every other week is beyond me. But it is NOT that expensive because it goes a looong way! I have used Modge Podge since the 70’s, yes I’m an old crafter, and there is a REASON it’s been around for such a long time people! I am so glad you cleared this up, now to retweet & pin this so others can see! I am SO glad you posted this! 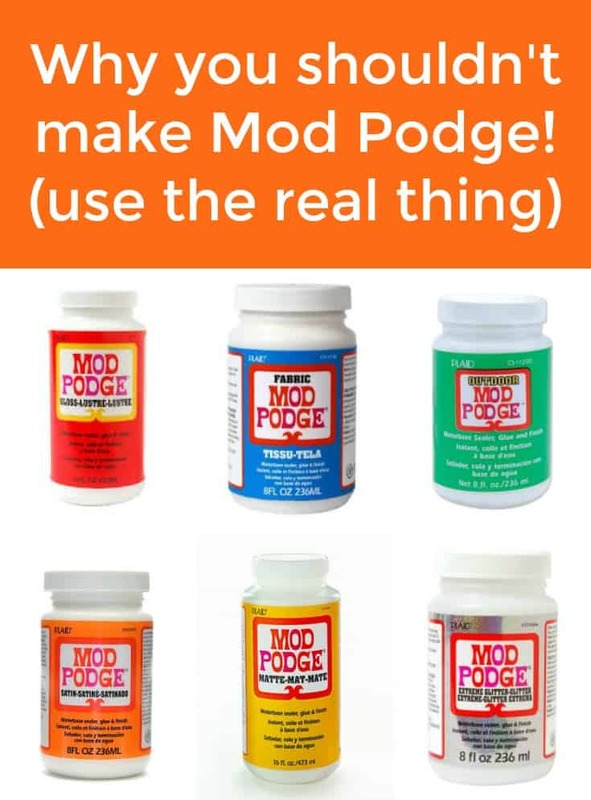 I’ve thought about trying to make a Mod Podge substitute, but have never done it and now I won’t! One less project to tackle. Thank you! My experience has not always been what you have described. I started decoupaging long before they had mod podge and we used watered down glue. I have had things that have lasted for years without any problems. I guess I have been lucky. I’m not against mod podge, I use it often. I prefer the finish of MP but if I run out of it I have no problem grabbing the glue. I would never try to make my own – why would I want to go to all that mess and fuss when I can just buy the stuff that works the best? So I’ll stick to buying Mod Podge with my 40% off coupons. I’ll also stick to calling it Modge Podge. I don’t know why. I kinda thought it had something to do with the sealer, but wasn’t sure. After experimenting with white glue, fabric stiffener & Mod Podge, it’s just better to use each product for what it’s made for, imho. And you’re right, Mod Podge lasts a long time, so the value is incredible. Amy, I am really glad you posted them. I saw the recipe and went for it. Something just did not feel right and I went back to my mod podge. It would kill me to think that something I put time in and sold did not pass the test of time! This is totally true. I tried to water down glue because I read it was the same thing. NOT EVEN CLOSE! Luckily any time I used it, I could fix it by either peeling it off and redoing it, or painting over it. Thanks for posting this! I was skeptical about those homemade ones anyway! I wish I had read this post before I decided to make my own. I now a large batch of watery-glue that hasn’t managed to actually make anything stick. I can’t stand the thought of just throwing it away (since I actually have some $$$ invested into it), so for now it has been condemned to a dark corner under the kitchen sink. The Mod Podge has taken back it’s rightfully spot in the craft box. Preach Amy! hehe, it’s Mod Podge for me too! Thanks for sharing! I’ve seen this on pinterest and wondered if it could be true. Thanks for shedding light on the subject. But I don’t think anything could ever replace my ooey gooey trusty mod podge! Remember In School When You Used White Glue To Coat Your Paper Mache Ideas And As Soon As It Got Wet It Got All Mushy And Sticky………….That’s Why Mod Podge Is The Way To Go. Most glues are acidic that’s why they can yellow and eventually “eat” away the paper. 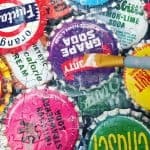 I use decoupage glue for most of my craft & art projects. I even used it to glue plastic bottle caps in my latest project! Thanks for this blog. I was just googling how to make my own Mod Podge since I can’t find it in any craft stores in Australia, when I came across your warning blog. I think I’ll try and find an alternative. If anyone can help me with what I might find in Australia that would be similar, please help. Thanks. Not sure where you’re from in Aus but i know Mod Podge is sold in Riot Art & Craft stores. I have to say, Finding Modge Podge in Thailand is like finding flying pigs. it just doesn’t exist. It would be nice to have it to use in my classroom (I’m an art teacher) but the expense of getting it shipped from the states makes it too expensive to consider. It would be great if this product was available on the international market. I know that Birch carries Mod Podge, not sure if they could ship it to you? Thanks so much. Since posting my comment, I have found Mod Podge in Spotlight stores here in Australia and have been using it to add graphics to my Shabby Chic restoration projects. Check out some of them on my blog! I LOVE MOD PODGE and it does indeed ROCK!! Thanks for posting this. So true, I have been experimenting with the homemade versions, but this makes a lot of sense to me, I’m glad I read it before taking on pricier projects like homemade signs!! I love Mod Podge and have used it a lot. I completely decoupaged a plain fake-walnut looking particleboard cabinet in a vintage rose giftwrap (now no longer being manufactured, boo hoo), and am currently scattering Victorian scraps over it. Believe me, I have used tons of Mod Podge to do this. At least two quart size jars so far! But when I ran out I used Durwin Rice’s formula of wallpaper paste mixed with Elmer’s white glue. It seemed to work well and I can’t tell the difference where I used it. With all the time and money invested in this, I hope it holds up! I plan to seal it with Varathane acrylic floor finish. I have more Mod Podge now to finish my scraps with because it seems to be easier to work with. Can get any more supplies in Ireland. Any craft shops are now only selling a Decopatch range instead. All say they can’t get supplies any more. HELP!!! I totally agree! I have seen the recipe flying around Pinterest and have never pinned it because it seems a bit sacrilege to me. 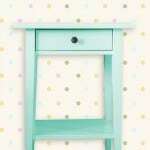 I a true Mod Podge girl- why reinvent the wheel? I have made the glue/water ‘ModPodge’ before and used it. I have never had problems yellowing or anything like that and I feel it works just fine. Hi Mrs. Edwards! I would agree. The flour and warm water is just flour, so no glue and sealing properties. I just wouldn’t go to the trouble when you can get a jar that lasts a long time, and you can get 40% off coupons all the time to the major craft stores. That makes it just a few bucks, which is what people spend on a latte. Followed this post from a comment on another thread with DIY glue recipes/recommendations. TY for the warnings! Yes, it’s not worth losing a nice piece of art you’ve created to save a $1 or 2. Sometimes, DIY is NOT the way to go. I have to weigh in on this one…Modge is great for paper projects, however for fabric, the watered down glue is fine. I used white school glue diluted slightly with water to adhere fabric cutouts to glass mason jars that are used as candle holders. I soaked the fabric cutouts in the glue/water mix, put them on the jars, used an rag to wipe of excess. When dry I sealed with an acrylic sealer as they also had been painted with craft paint. This was in 1998! They are still in perfect condition, no yellowing, the cut outs have not come loose. Lisa, while you may have had success, several of the destroyed projects I have seen have used fabric. I absolutely stand by what I said and do not recommend it – especially for wear and tear items like furniture. 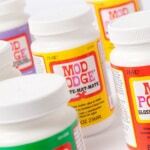 There’s no reason to take the chance when a bottle of Mod Podge is not that expensive. My mod podge stash which I got from the US thro a friend(I live in India) is almost done and I was tempted to try the home made version! Now to wait for someone else to go to the US..
I’m in the exact same predicament. I live in Bolivia and can’t get modge podge :o( Was thinking about making my own until I ran across this post. Guess I will have to put that on my wish list for a care package or a friend to bring back from U.S. I make my own modge podge with flour, sugar, and water. I wallpapered my office with brown paper bags, and it looks great! Isn’t that called “paper mache”? Just did this with my high school art class (except used salt so it wouldn’t mildew). I just opened my modge podge and it looks like a big ball of dough. What can I do to thin it out again? Hi Crystal! How old is it? All acrylic products (and Mod Podge is acrylic) have a shelf life. You should throw out and buy new. I’m so glad I found this blog entry. I am getting ready to breathe new life into an old file cabinet. This will be the first project of its kind for me. So….In doing some ‘research’ on mod podge, decoupage, hodge podge (lol) I came across your website. Great site! Useful information for a newbie ‘podger’ like me!